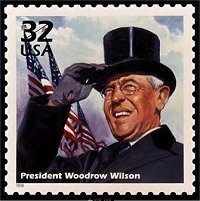 President Wilson signed a bill on June 15, 1916, which was passed by both Houses of Congress by unanimous consent, granting the Boy Scout organization federal incorporation. He also officially established Flag Day by proclamation in 1916. The 1998 Woodrow Wilson Commemorative shows Wilson departing for the Paris Peace Conference. 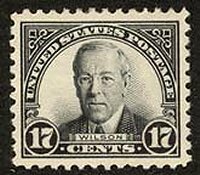 Thirty-two cent stamp from the Celebrate the Century, 1910-1919 series.